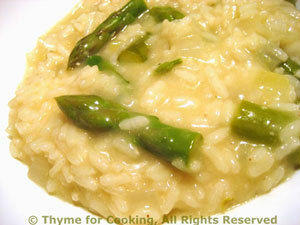 Easy Dinner from Thyme for Cooking: Asparagus Risotto. One of the last risottos of the season - I always wait to have a few with spring vegetables. As this is very simple, I wanted something light to go along with it... Tuna Cakes (which I normally serve as a first course). Usually, when produce is at it's peak, the simplest preparation is the best. Heat chicken stock and keep hot over low heat. Prepare asparagus, cutting to 1 1/2 inch length, reserving tips. In medium sauce pan heat butter; add onion and sauté until transparent then add rice and sauté, stirring, for 2 - 3 minutes until rice has white center. Add white wine and stir. When stock is almost absorbed add another 1/3 cup and continue adding 1/3 cup at a time and stirring. Before the last 2 '1/3 cups' are added put in the asparagus tips and the chives. Before the last 1/3 cup is added taste a few kernels of rice. They should be just 'al dente' - slightly resistant to the tooth but fully cooked. If more stock is needed add it 1 tbs at a time and waiting until almost completely absorbed. At this point risotto will be thick but not stiff - it will not hold it's shape on a plate. Add the Parmesan, stir, pour into a bowl and serve immediately. It will continue to absorb liquid and the leftovers (if any) will be quite stiff. The risottos that we have eaten in northern Italy have all been served in soup plates (flattish bowls) and eaten with a spoon - not a fork. Garnished with small white asparagus and a Balsamic vinaigrette, this is a light first course, reminiscent of a salad, but perfect for winter when we have no lettuce. Drain the tuna and put into a large bowl. Whisk egg in a small bowl. 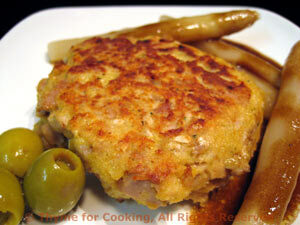 Add mustard and breadcrumbs, mix well. Add egg mixture to tuna and gently mix. Divide and form into 2 patties. Heat oil in medium nonstick skillet over medium heat. Add patties and fry, 7 - 9 minutes, until starting to brown. Carefully turn with a spatula and sauté another 5 - 6 minutes. Remove and serve.